Thundershirt Anxiety Relief Dog Coat is an extremely advanced way to treat anxiety and behavioural problems in your dog. The Thundershirt helps to relieve anxiety, calm excitement and refocus a dog's attention due to the unique design of the coat. Applying a constant gentle pressure has been shown to have a dramatically calming effect due to the way the pressure acts on the nervous system. 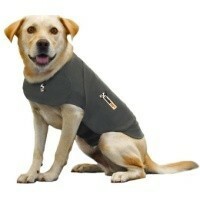 Thundershirt utilises this highly advanced technology in its coat to produce the same effect on your dog. For a large percentage of dogs with issues such as fear, barking, travel anxiety, crate anxiety and noise anxiety, the Thundershirt has been proven to radically improve behaviour. Due to the thin breathable material, there is no concern about loss of comfort or overheating of your pet. Sizes are taken from the chest size of your dog, size guide given below. Extra Small 13"-18" 8-14 lbs.